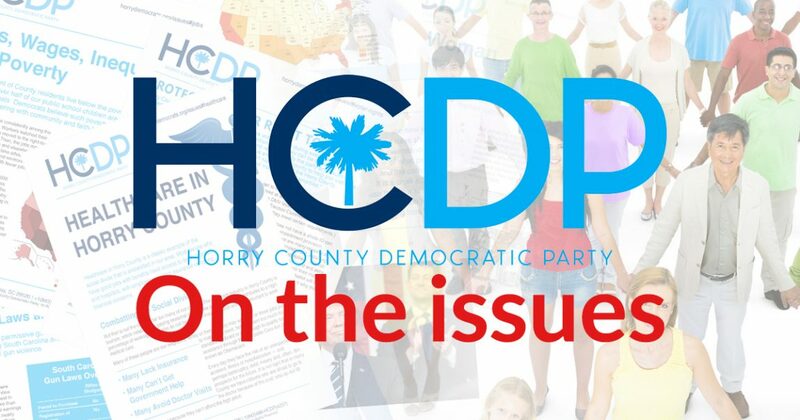 Horry County Democratic Party has developed a series of “white papers” outlining our position, concerns, and call-to-action on the many issues that affect us all. The papers are available here or by clicking on the “Issues” navigation button above. The papers, developed by an outstanding team of volunteer writers and editors who are committed to electing Democrats, are intended to offer rational, fact-based discussions about topics that concern voters rather than simply calling out Republicans for their failures or criticizing those in office. Simply put, The Horry County Democratic Party believes in cooperation, respect, and teamwork. We believe that unity is better than division and that we can – and must – work together to protect civil rights and voting rights, women’s rights and workers’ rights, LGBTQ rights, and the rights of people with disabilities. Each child deserves a good education and decent healthcare, no matter what zip code they live in. We work to make the changes necessary so that Americans can balance work and family, so that there is equal pay for equal work, so that our veterans are cared for at home, and so that seniors can retire and live with dignity. We will aim to protect every citizens’ right to vote and fight to end the currently broken campaign finance system. We learn from the scientific facts that climate change poses a real and urgent threat to our economy, our coasts, our resources, our national security, and to our children’s health and future. We can work together to build bridges and strengthen our local communities. Please check them out and feel free to share with your friends and neighbors. We hope they will be helpful as you decide who to vote for on November 6th.